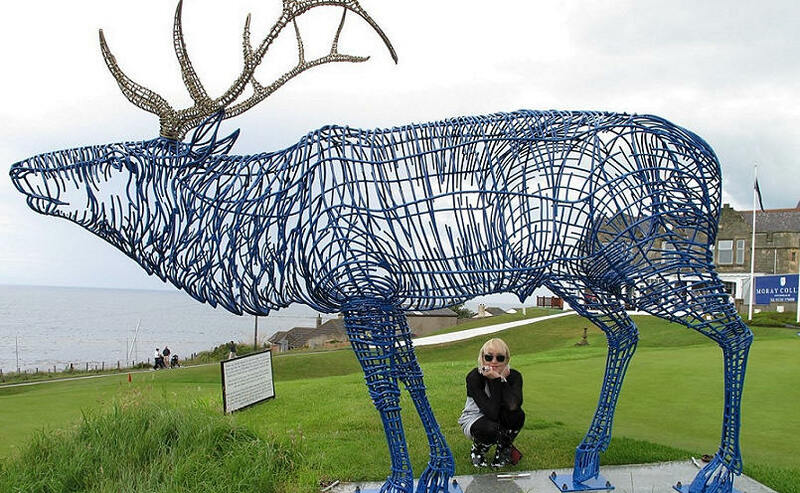 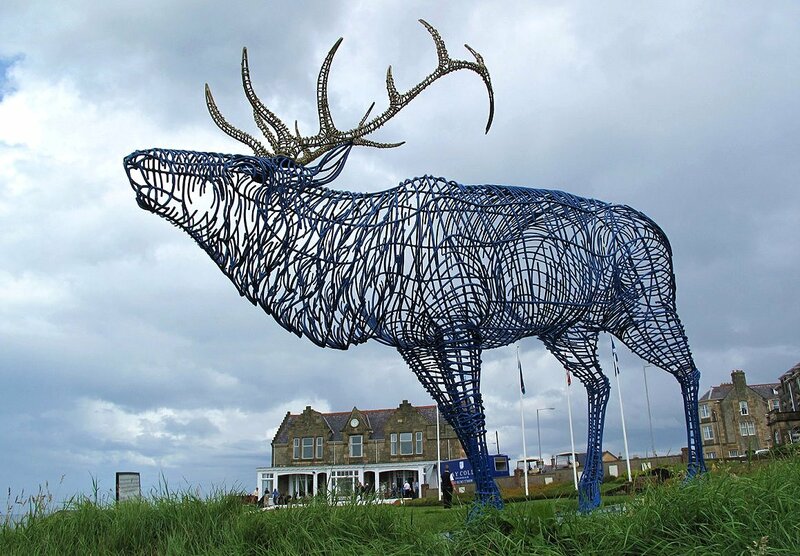 10 foot tall stag, galvanised steel. 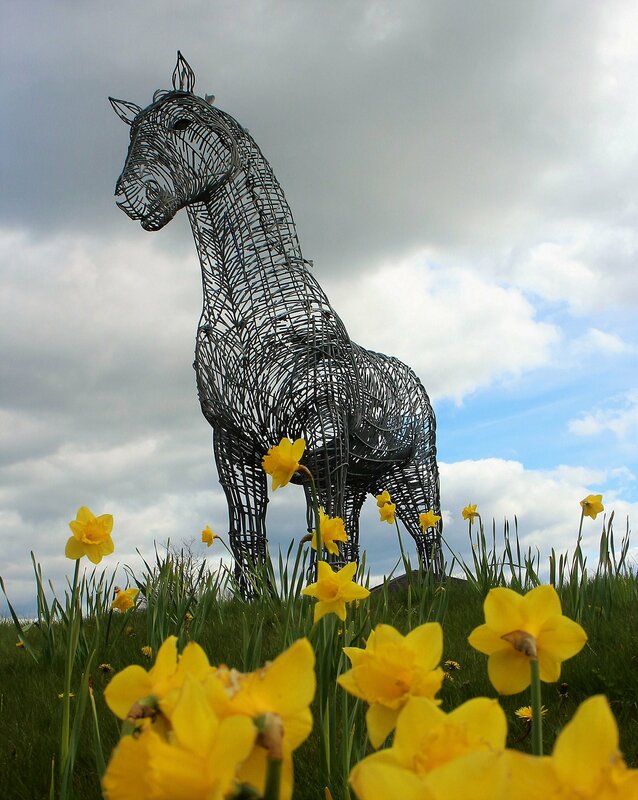 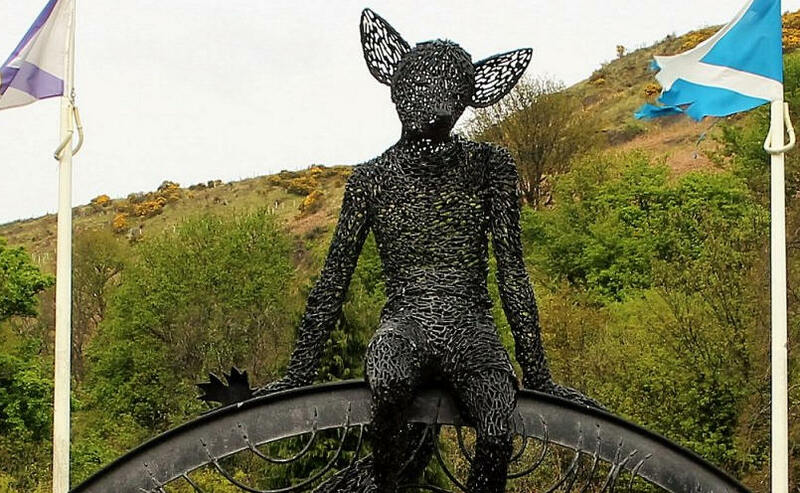 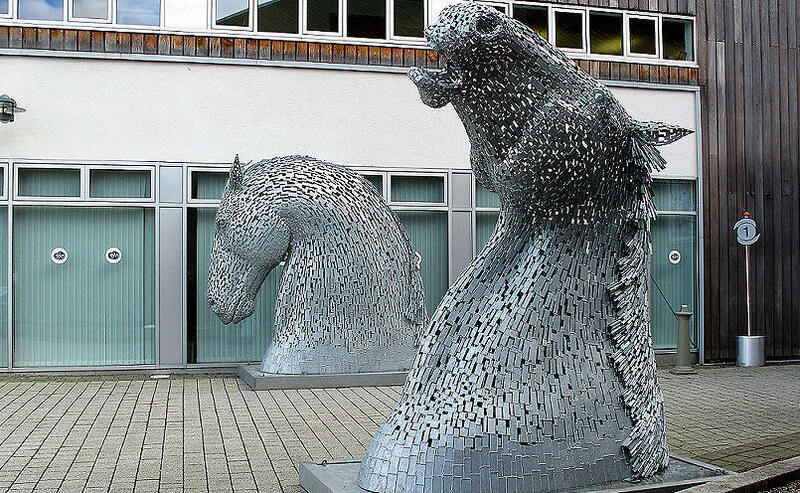 Location varies around Scotland, home is the galvanising firm Highland Colour Coaters in Cumbernauld, Scotland, a firm which does a lot of the glavanising of Andy Scott sculptues. 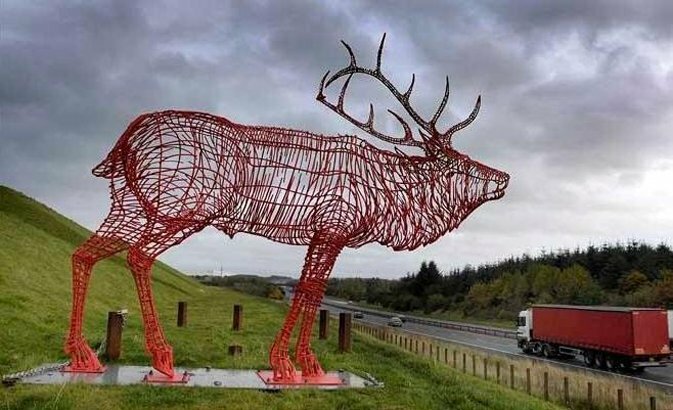 Red seen at Pyramids Business Park overlooking the east-bound carriage of the M8 at Bathgate. 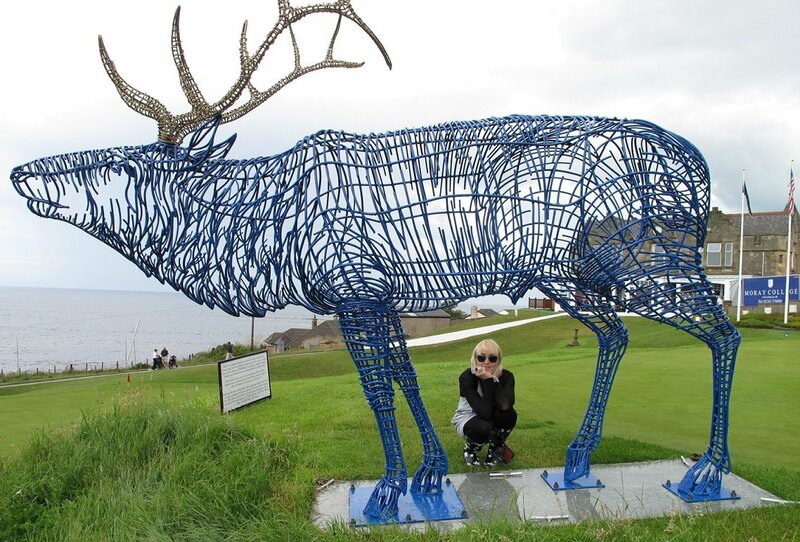 Blue seen at Lossiemouth Golf Club. 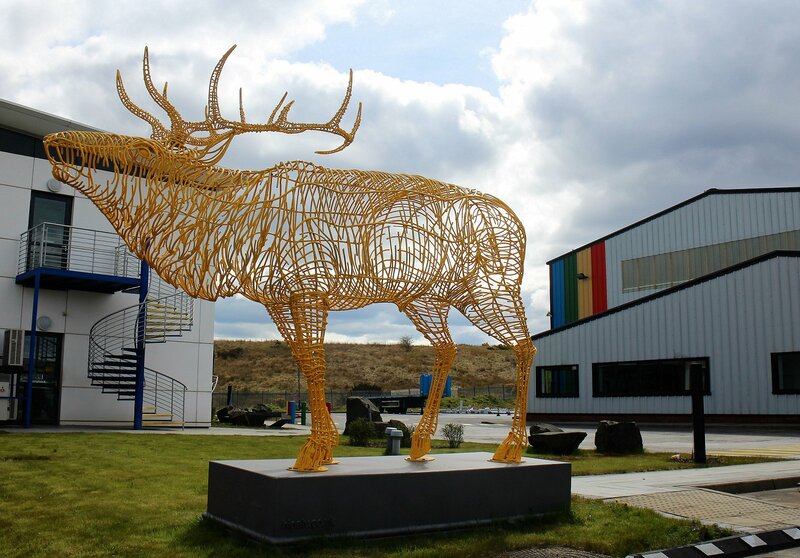 Yellow seen at Highland Colour Coaters Cumbernauld factory (G67 2JH). 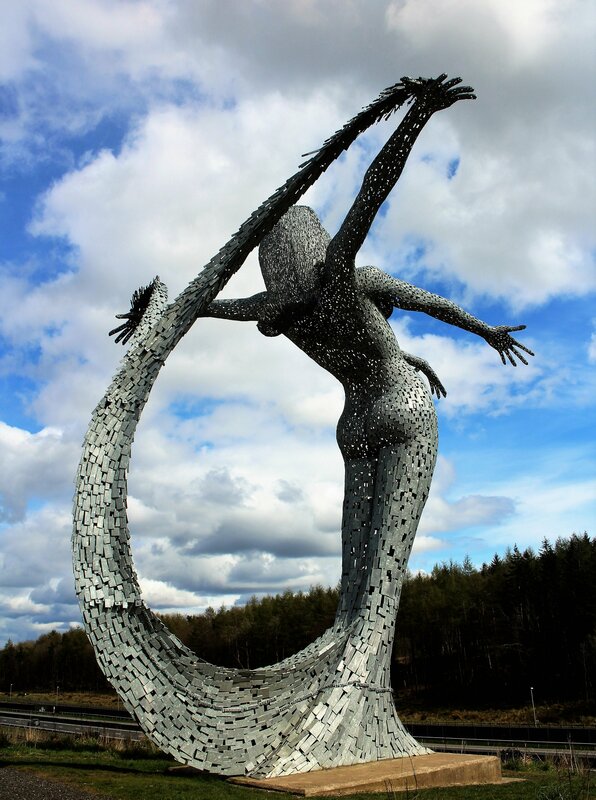 Overlooking the west bound carriageway of the M8 in a field next to Glasgow Business Park in Easterhouse. 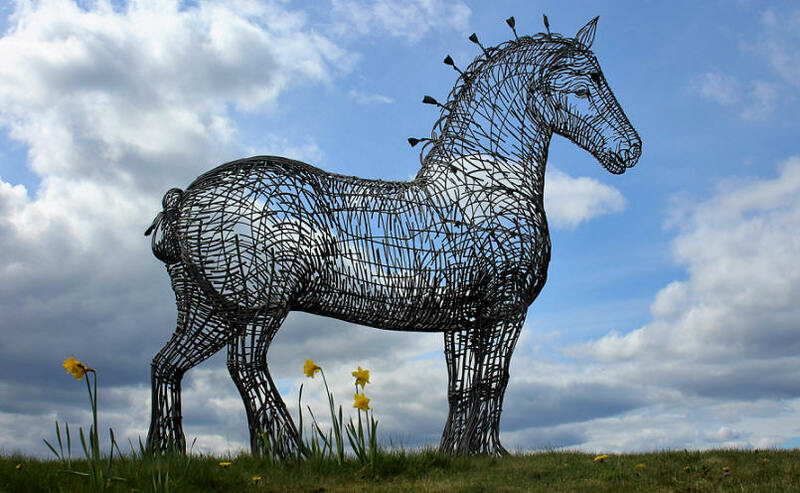 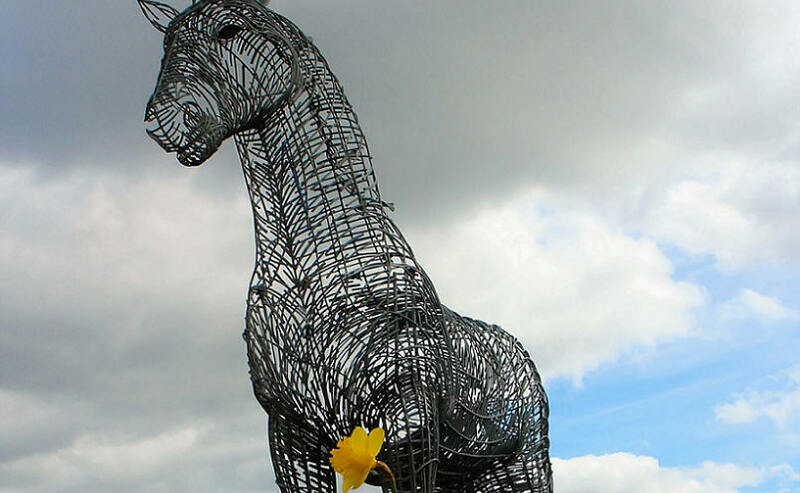 A 4.5m tall Clydesdale horse constructed from thin rounded galvanised steel rods giving an airy openness to the heavy horse. 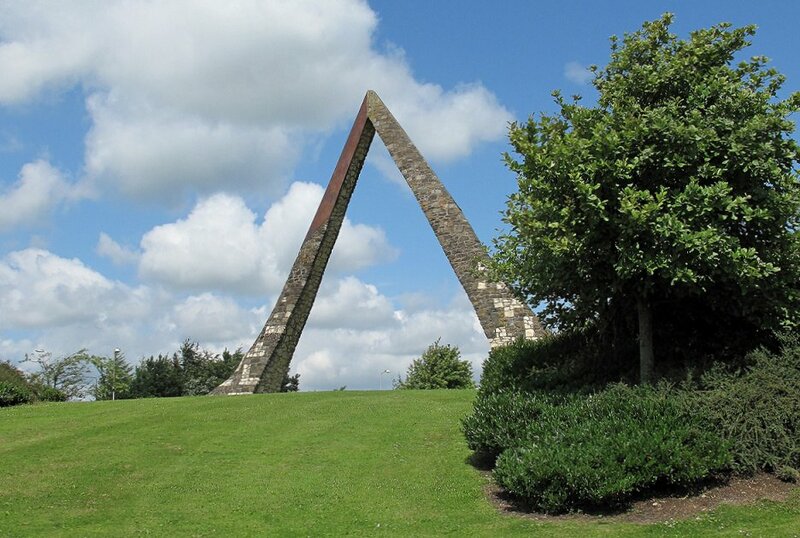 Commissioned in 1997 by the then business park owners (G69 6GA). 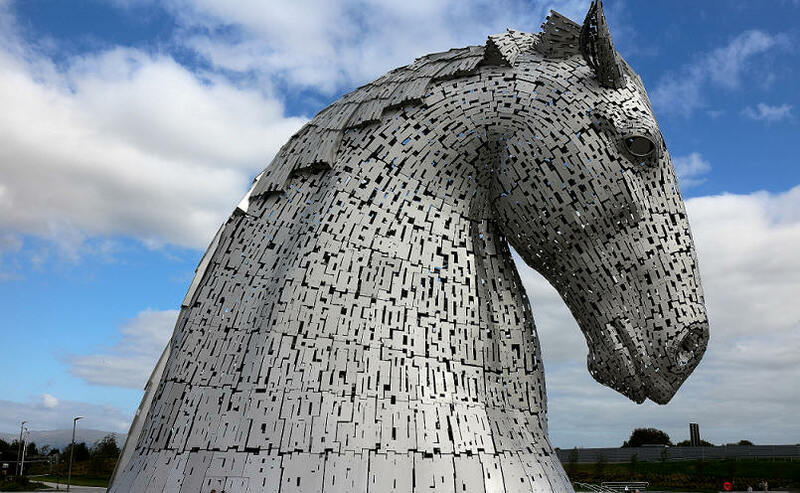 Two 30 meter high horse-head sculptures, each 300 tonnes of structural steel with a stainless steel cladding, are the largest in the world. 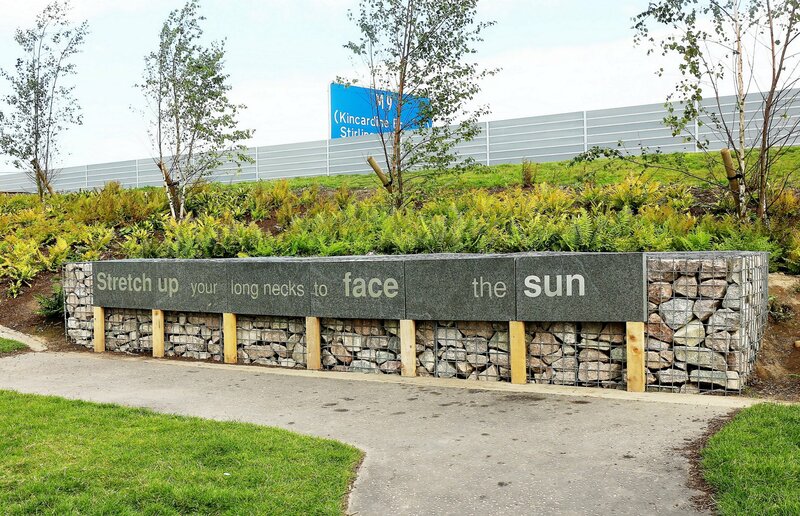 Situated next to the new extension of the Forth and Clyde Canal near the River Carron, in The Helix Park at Falkirk (FK2 7ZT). 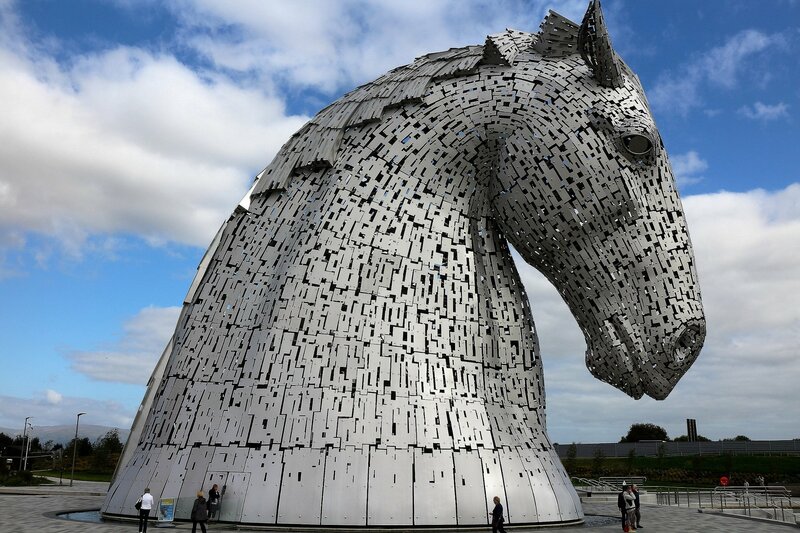 Kelpies are Scottish mythological shape-shifting equatic beasts usually taking the shape of a horse and possessing the strength and endurance of 10 horses. 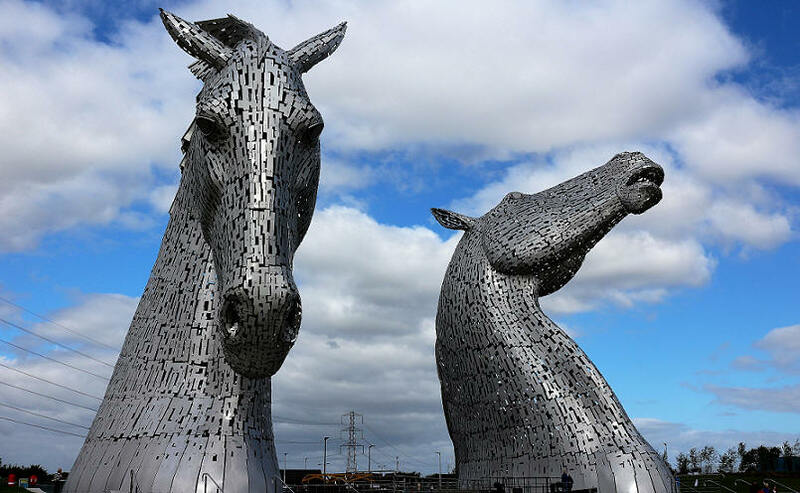 The Kelpies sculptures represent the transformational change and endurance of Scotland's inland waterways and the historic lineage of the heavy horse of Scottish industry, agriculture, transport (including the tow horses of the canals) and economy. 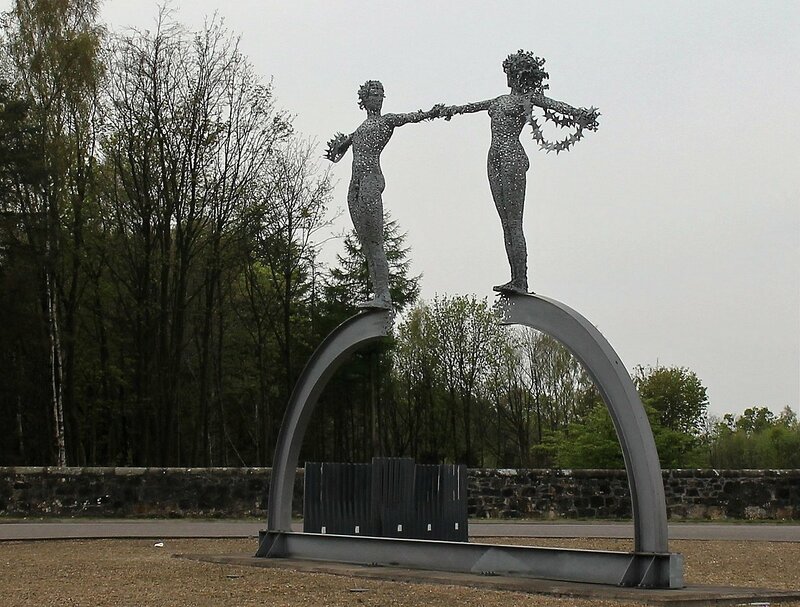 There are two sets of 1:10 scale marquettes. 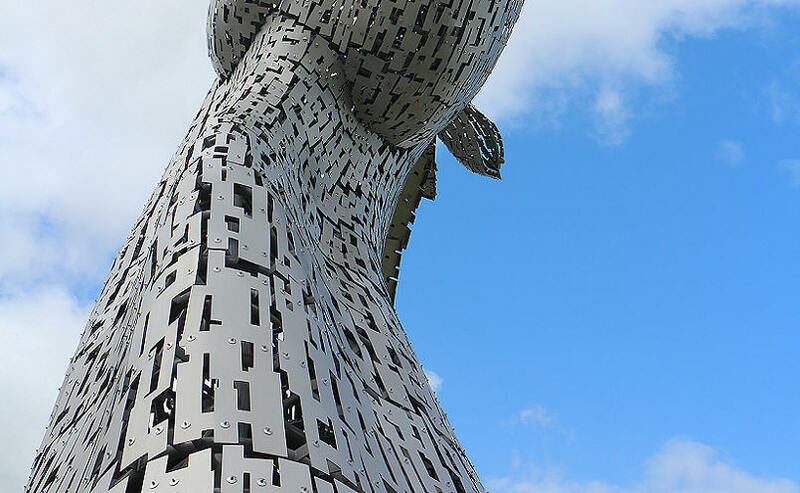 These have been displayed in several places in Sotland and other countries. 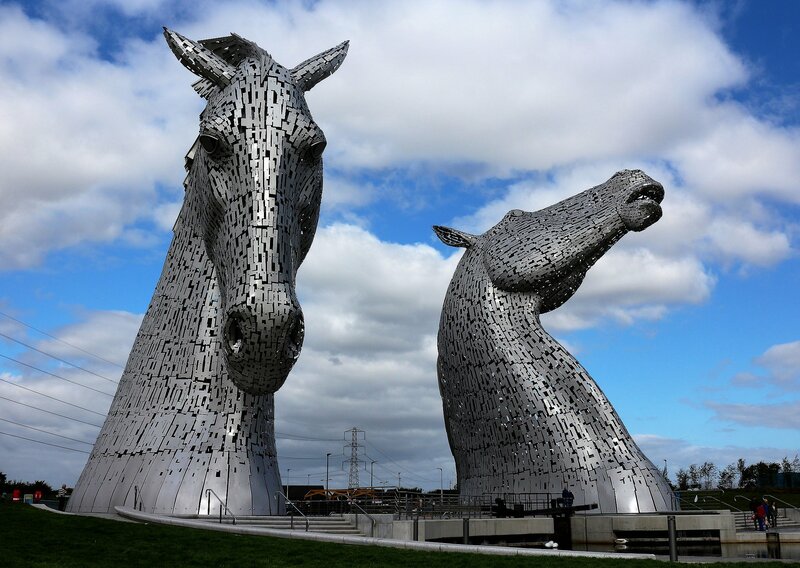 I spotted them at Edinburgh Airport and The Falkirk Wheel. 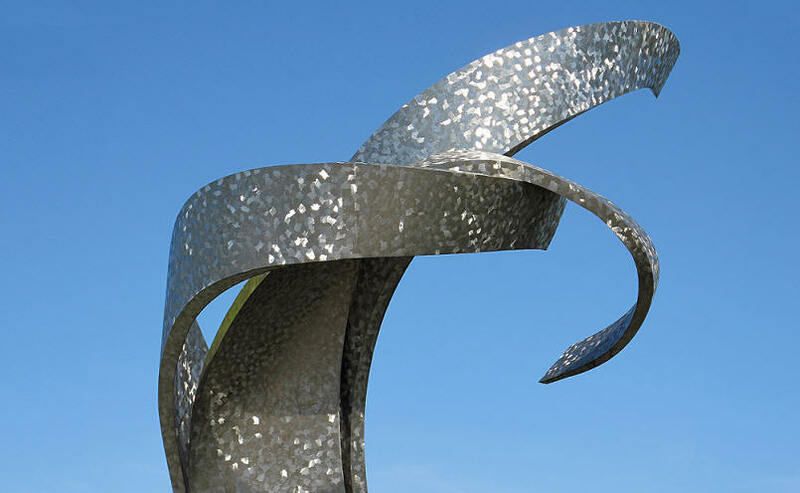 They're sculpted from steel, small plates of steel welded by hand then galvanized using a hot dip process. 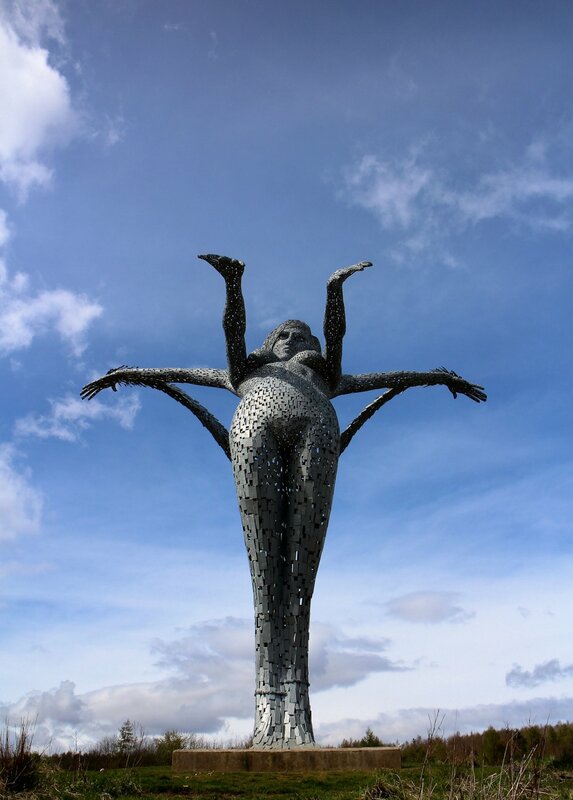 Arria, also known as The Angel of the Nauld, overlooks the the M80. 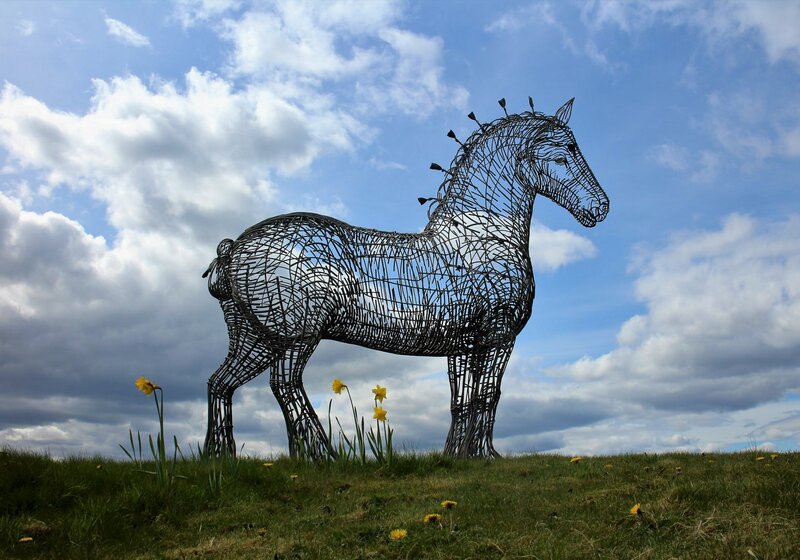 Drive into the village of Balloch then Eastfield, she's sited next to Eastfield Cemetery (G68 0EA). 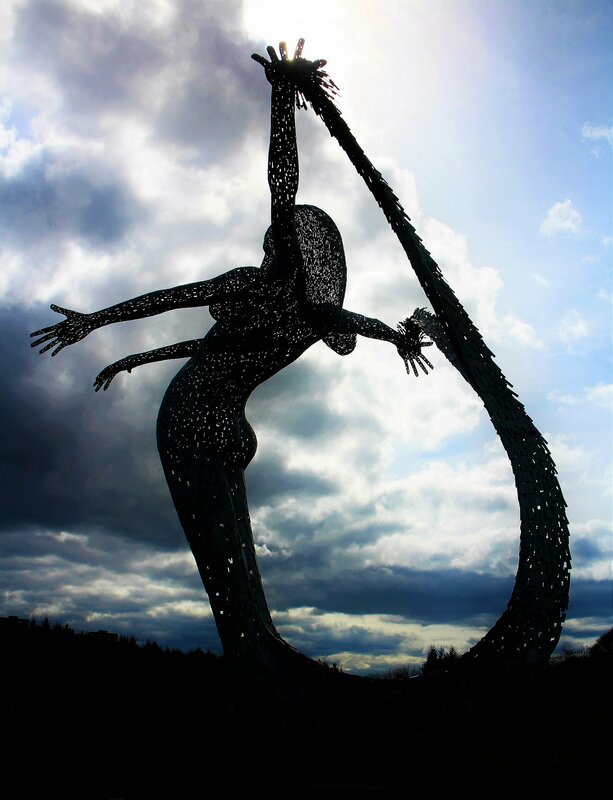 A female figure, 10 meters tall, with two large swooping arcs from the upraised palms of her hands to the fishtail hem of her dress, the flow of water being represented in the arcs. 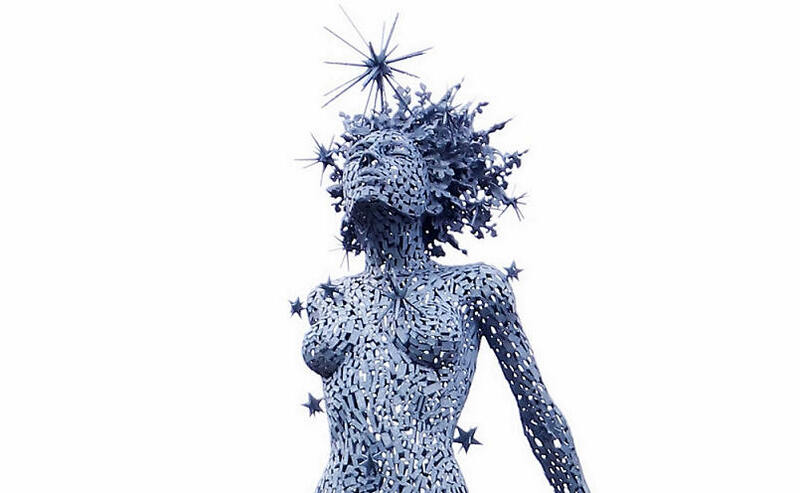 You can choose to see her with two sets of arms, or as I came to see, her arms are fluid, in motion. 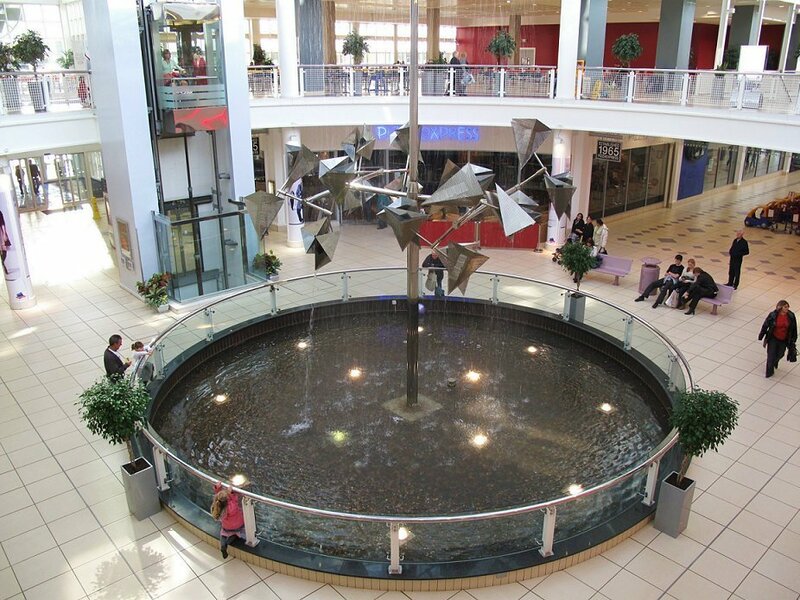 The Gaelic name for Cumbernauld is “comar nan allt”, which translates as “the meeting of the waters”, referring to local streams which join Scotland's two greatest rivers, the Forth in the east, and the Clyde to the west. 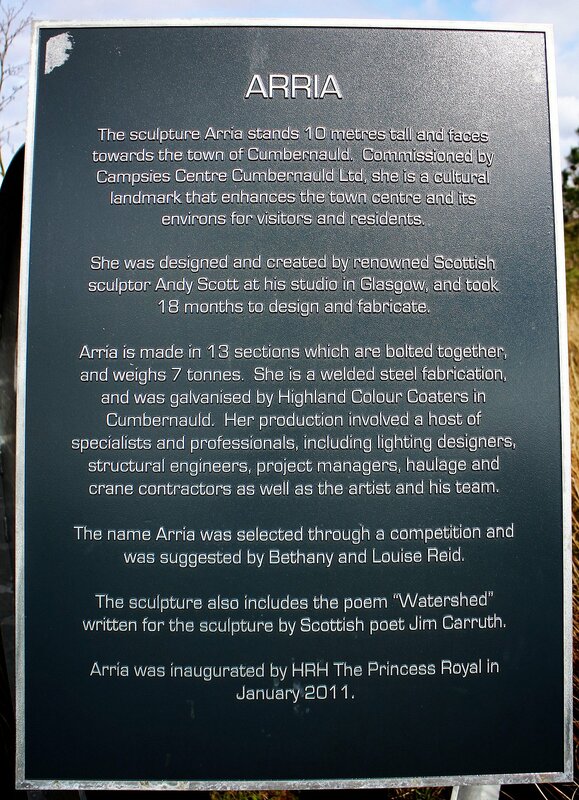 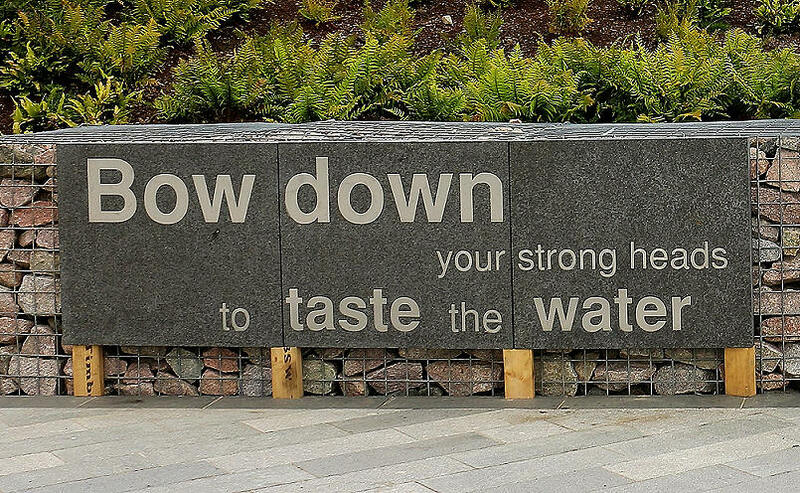 "Watershed" a poem by Jim Carruth, is inscribed around near the bottom of the sculpture. 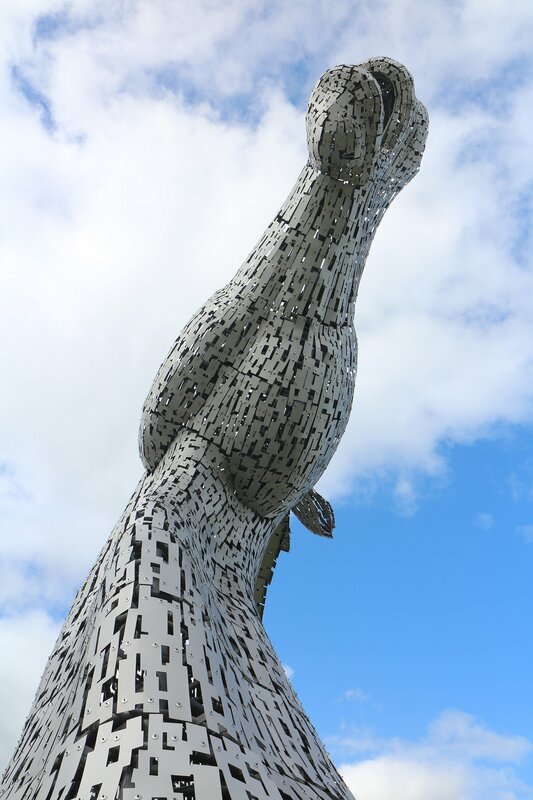 Erected on 24th August 2010. 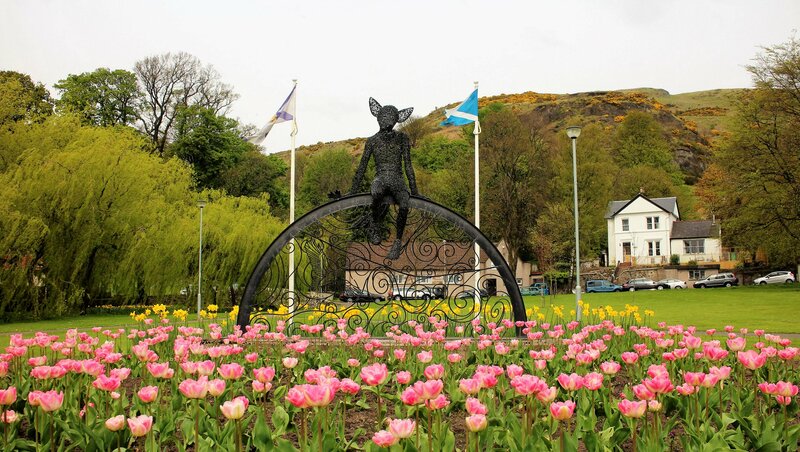 What's with the putting of sculptures on roundabouts? 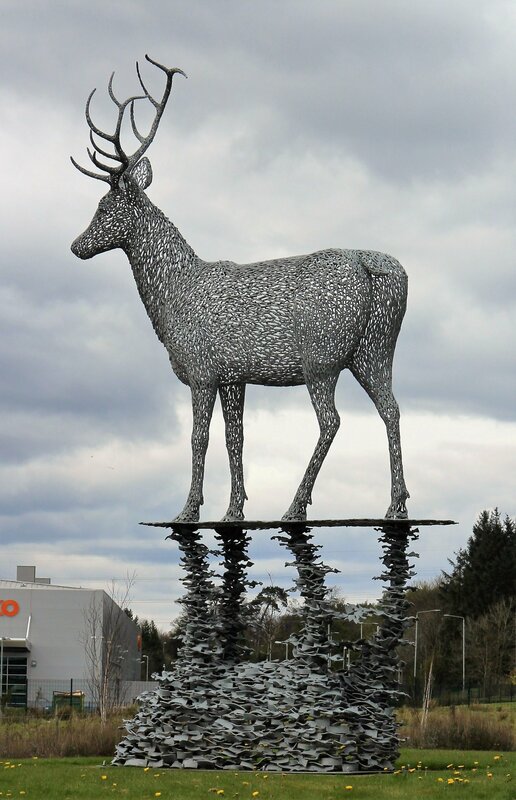 A beautiful sculpture, shame about the traffic and lamp posts. 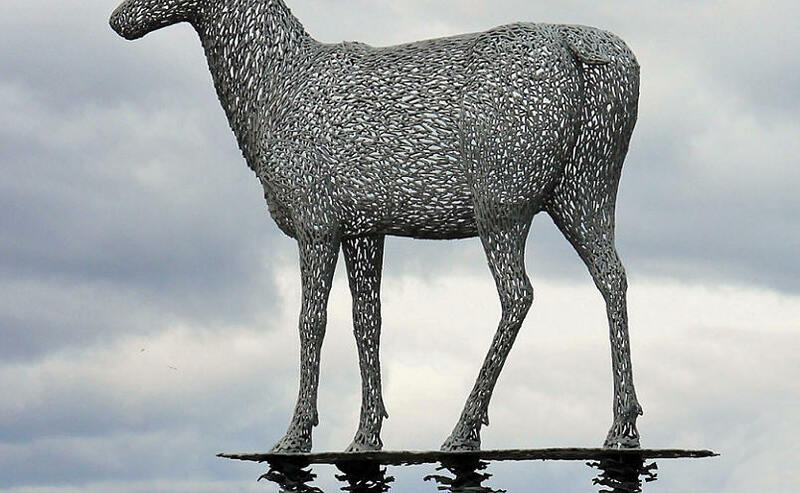 6 meters tall and two tons of metal, the stag stands atop a raised plinth which gives the impression of standing in water with a reflection underneath, very effective. 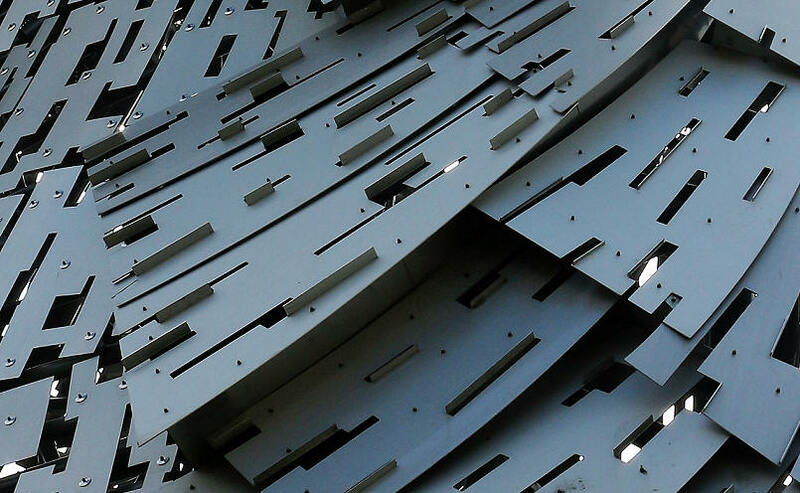 9.5m high, 4.5 tons of stainless steel sheet welded to form hollow box sections that were then curved into twisting components. 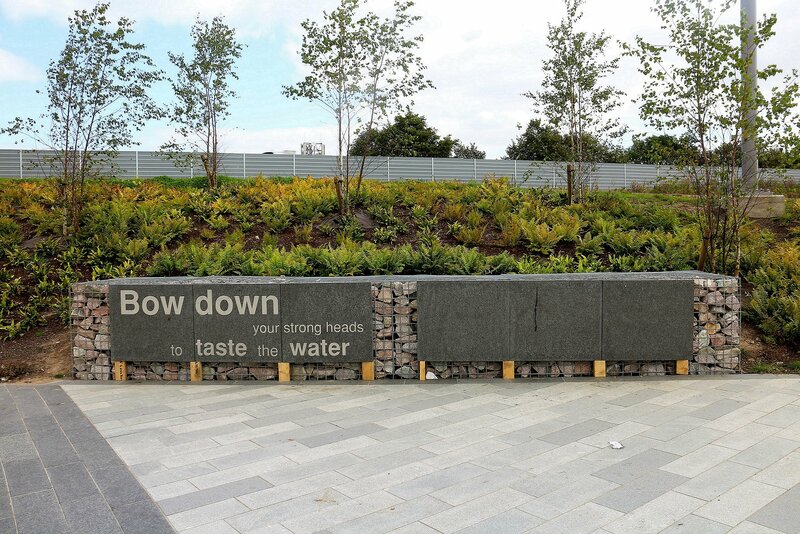 Location Retail Park at Homebase car park, Livingston, West Lothian, Scotland. 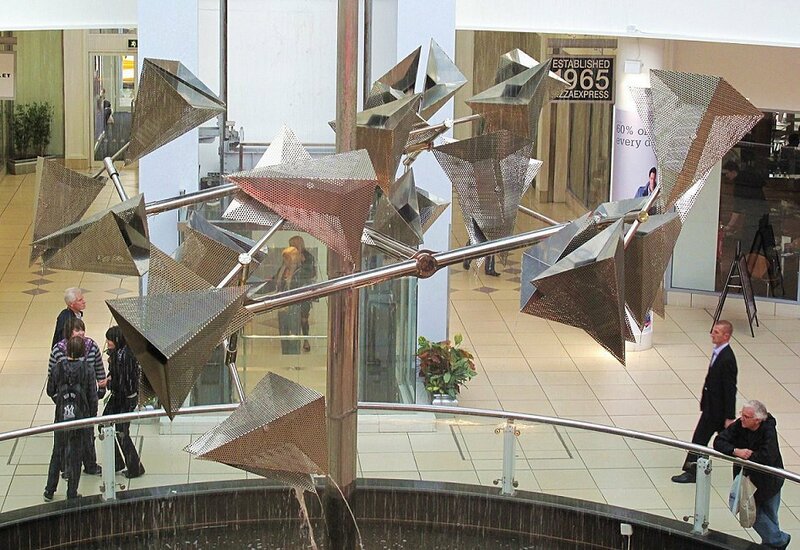 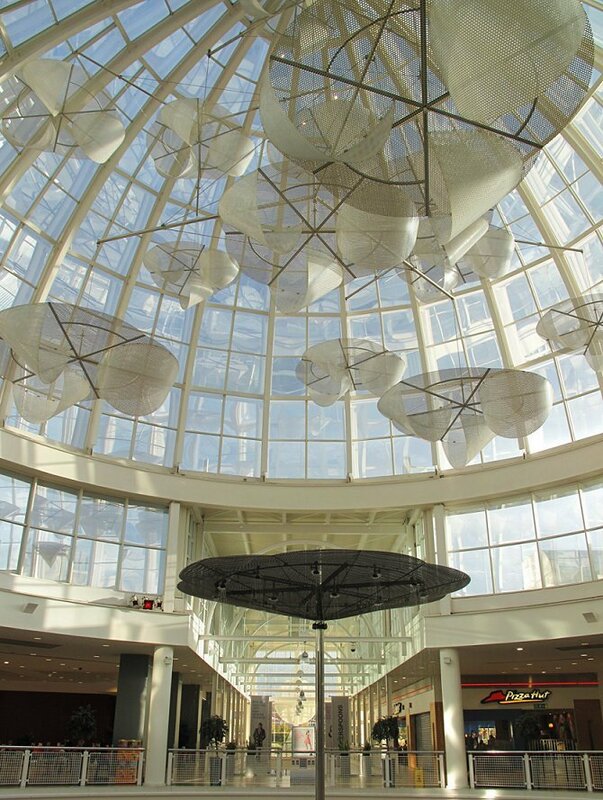 Spectacular water fountain sculpture features cascading rain and floating clouds. 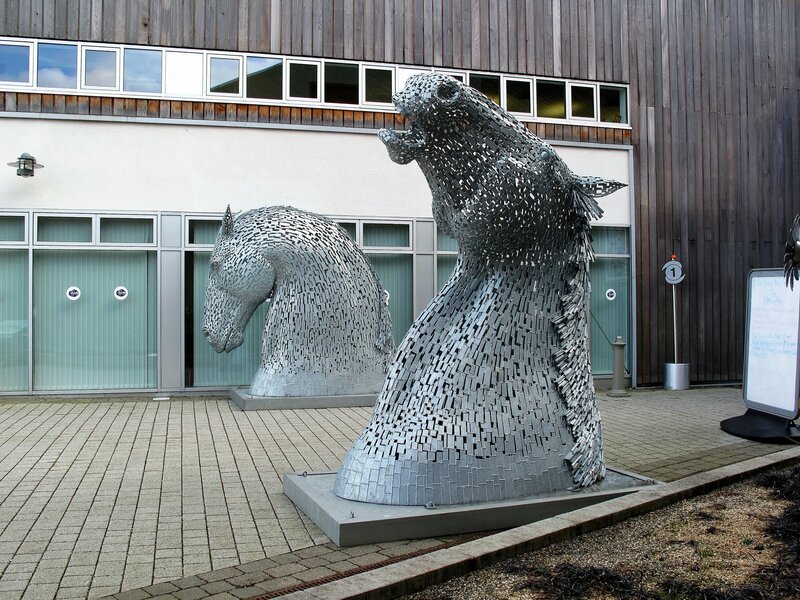 Location Livingston Designer Centre, West Lothian, Scotland. 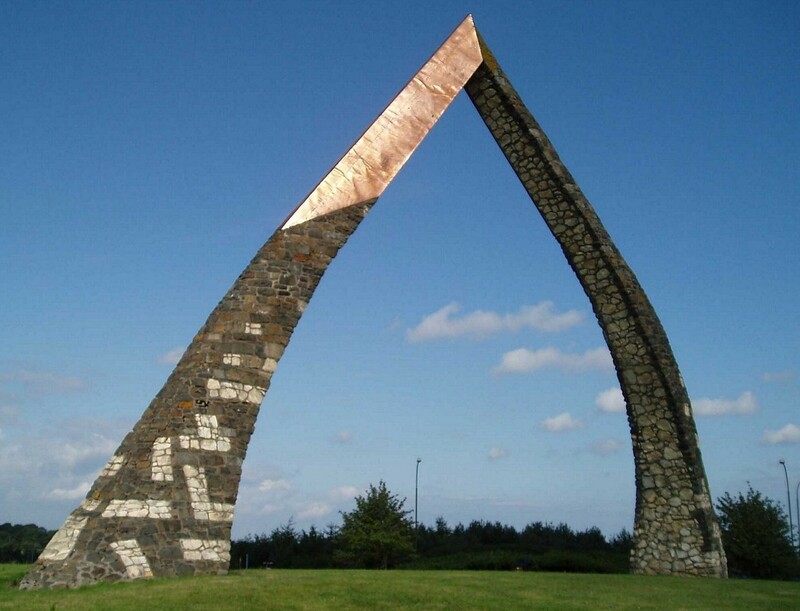 1996 stonework and copper. 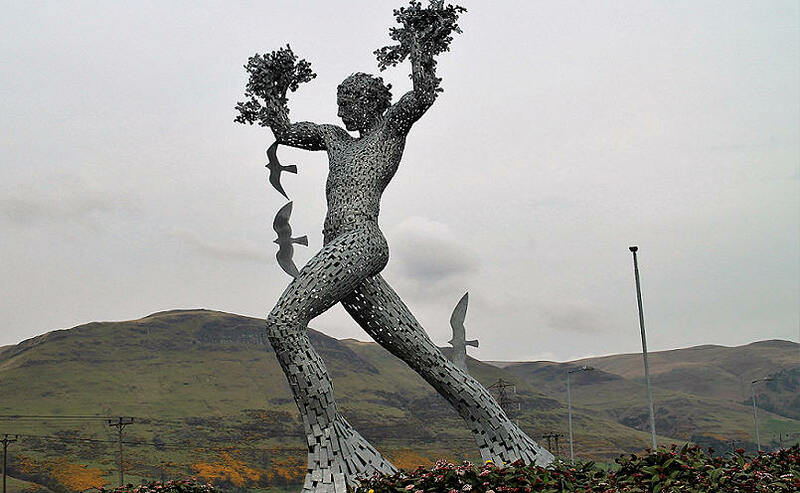 Located at Livingston East roundabout, West Lothian, Scotland. 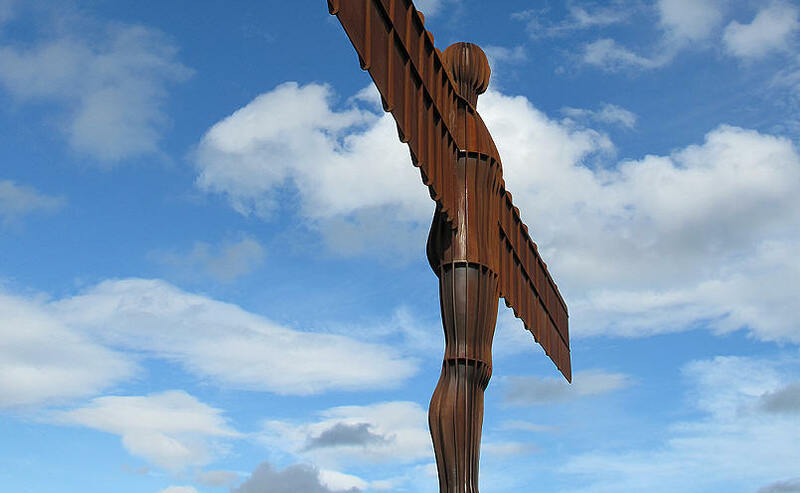 Steel sculpture of an angel, standing 70ft (20m) tall, with wings measuring 90ft (54m) across. 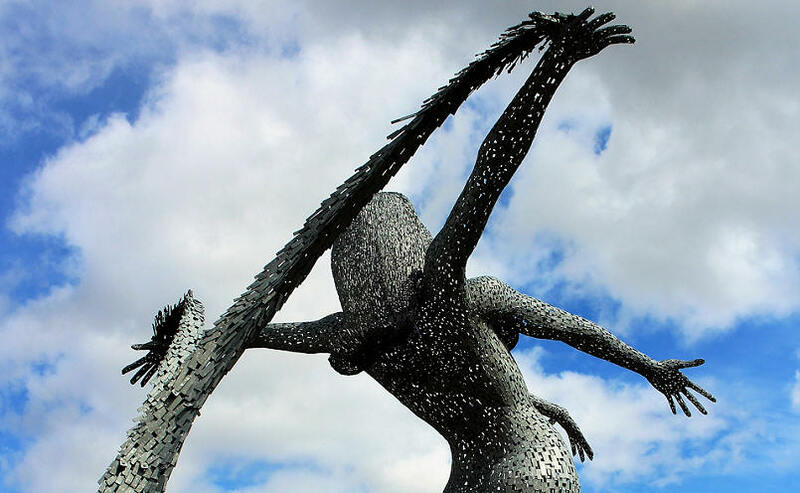 The wings themselves are angled 3.5º forward to create "a sense of embrace". 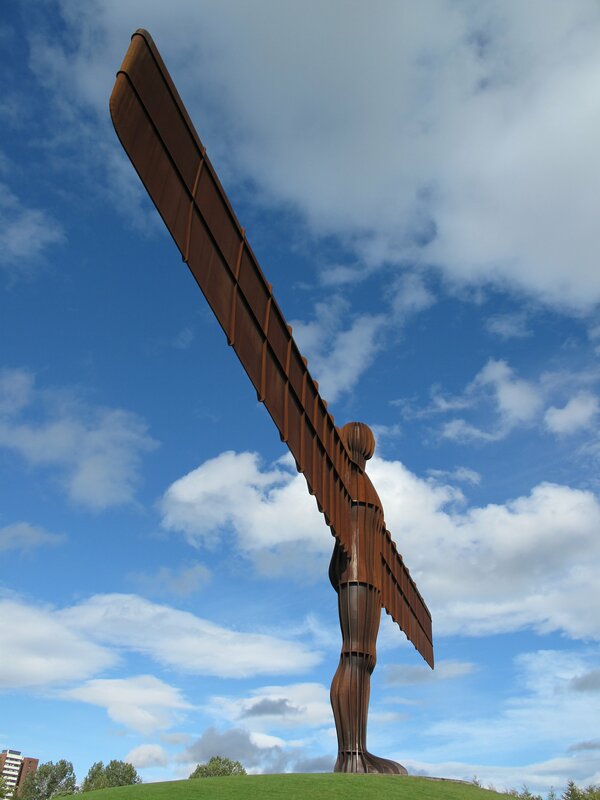 The Angel stands on a hill on the southern edge of Low Fell, Gateshead, near Newcastle, England. 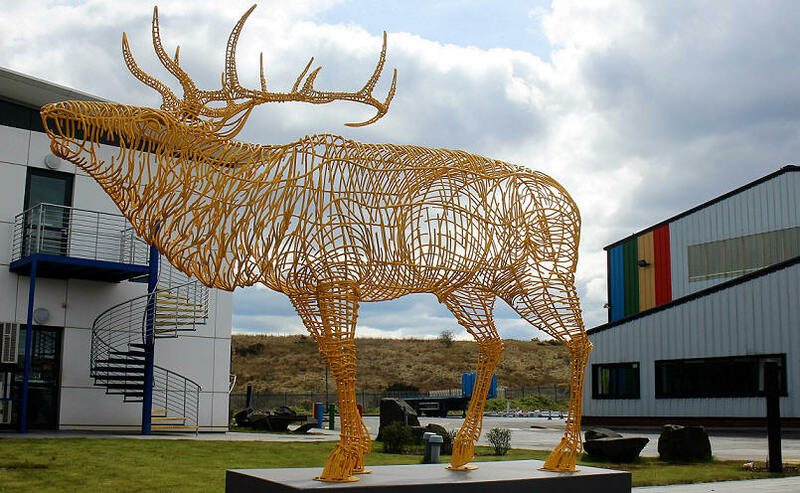 Lelystad in Holland, made in Scotland. 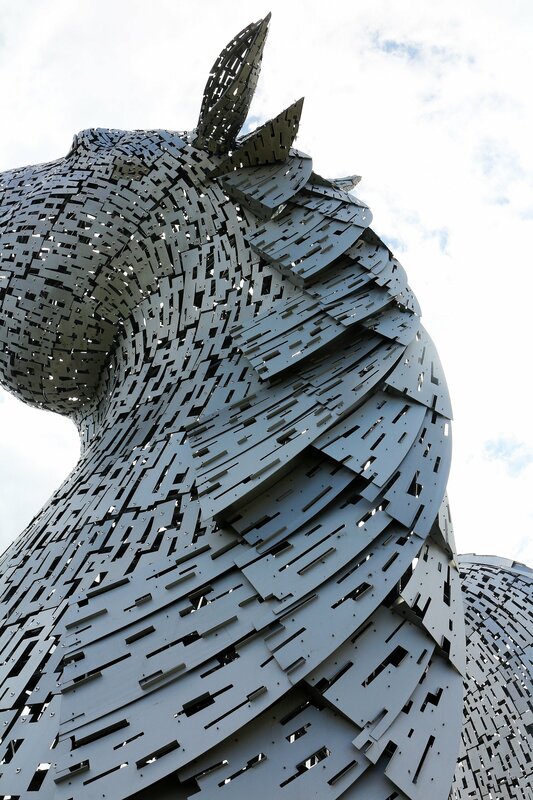 25.5 metres tall, weighs 60 tonnes, made of more than 5000 randomly orientated elements in a variety of angle-sections that connect in 547 nodes with the use of 14000 bolts. 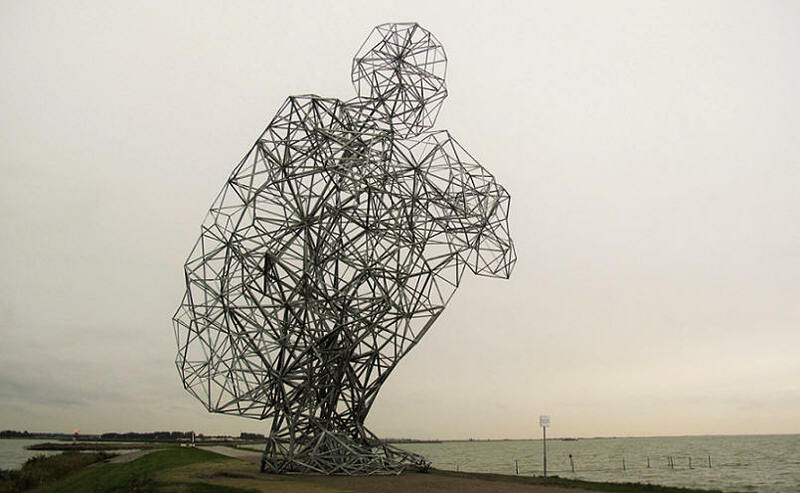 If this crouching man stood up, he would be over 100 metres tall. 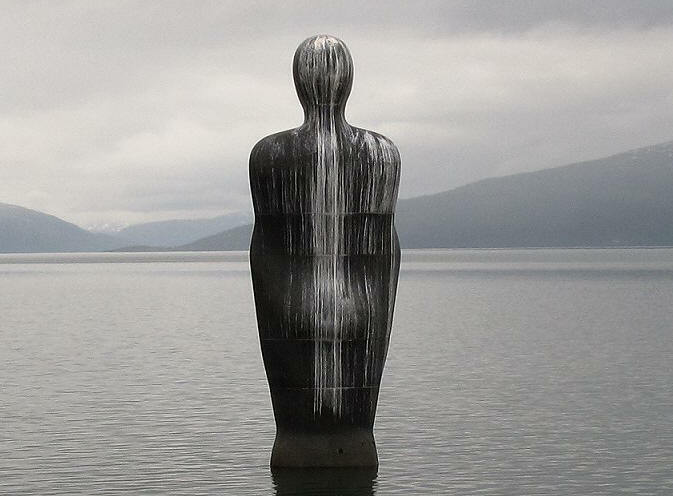 Broken Column consists of 23 1.95m cast and sandblasted iron figures based on a casting of Gormley's own body placed in an imaginary column from Stavanger Art Museum to Stavanger harbour. 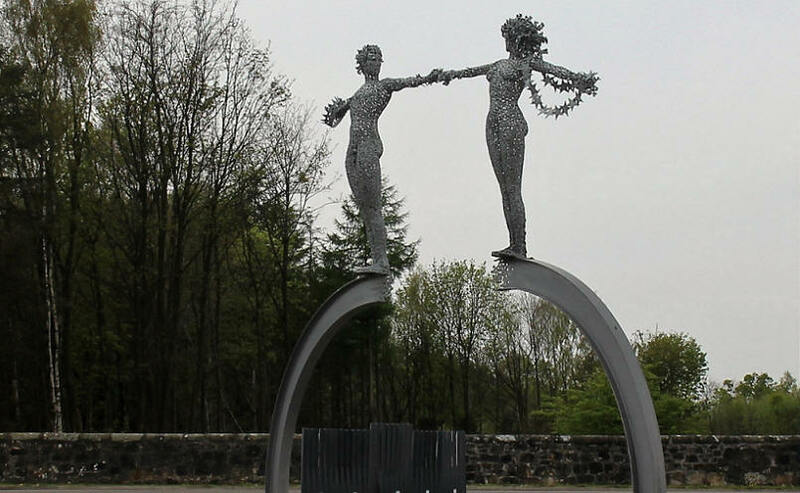 The figures in sandblasted iron are based on a casting of the sculptor's own body, and their placement reflects a broad perspective of people's life in this city. 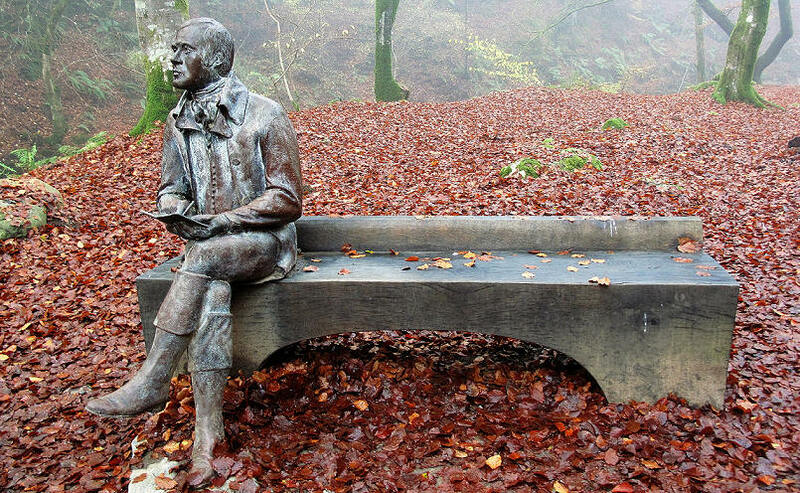 From the teeming life of the harbour, the din of traffic and bustling activities in the commercial quarter, to the courts and legal offices, the quiet calm of the churchyard and private lives behind closed doors. 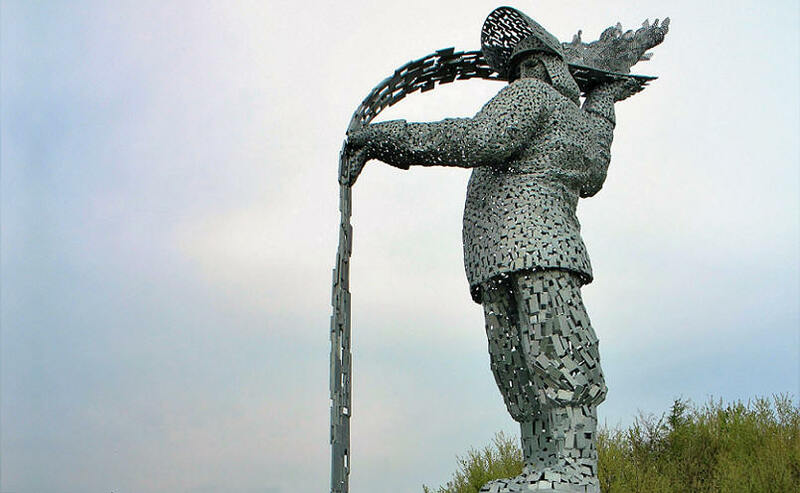 The iron figure standing in the fish market forms the cardinal point for all the other sculptures. 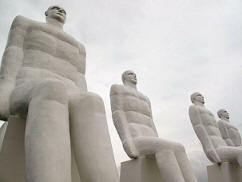 It gazes along Skagenkaien, 10 degrees towards the west, out to sea. 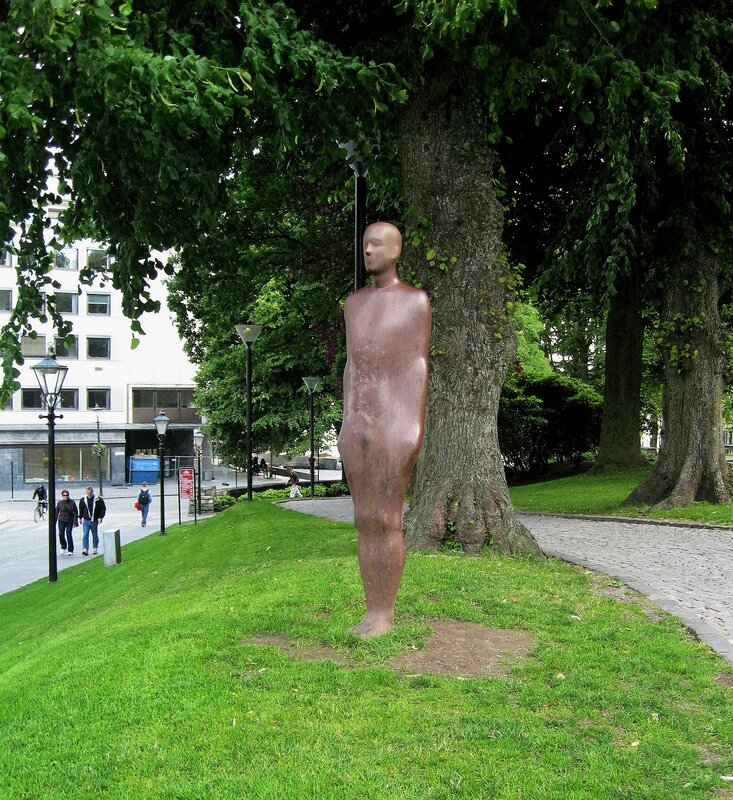 The very first sculpture was placed in its own room in Stavanger Art Museum. 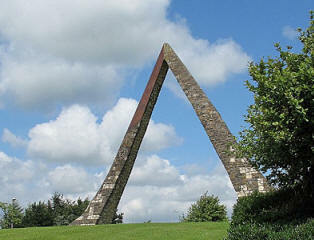 It stands 41.41 metres above sea level. 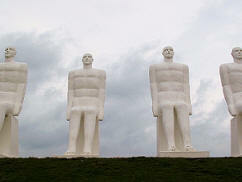 The next sculpture to be seen on the journey to the sea stands in Mosvannparken at 39.46 metres altitude (41.41 - 1.95). 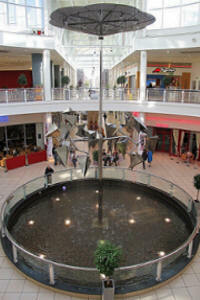 The column of figures continues in this fashion down towards the heart of the city, through the city and towards the sea. 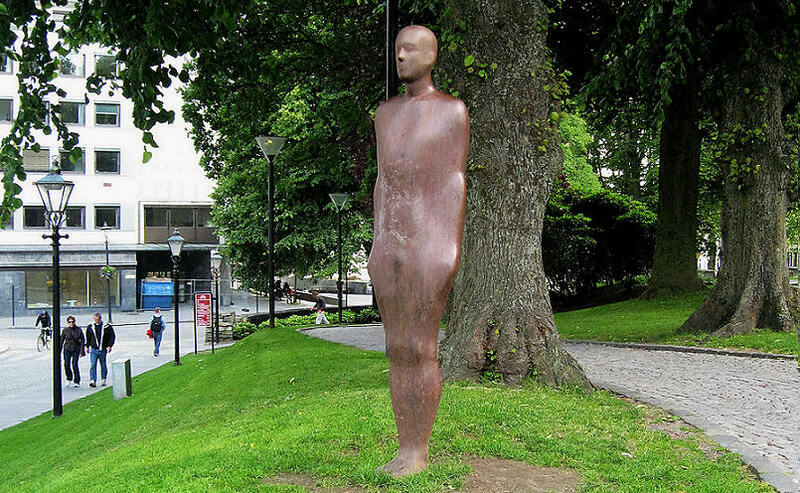 The final and 23rd sculpture stands with 149 of its 195 cm underwater, on a rock beyond Natvigs Minde in Stavanger's port basin.Stavanger has a special sculpture project, Antony Gormley's "Broken Column". 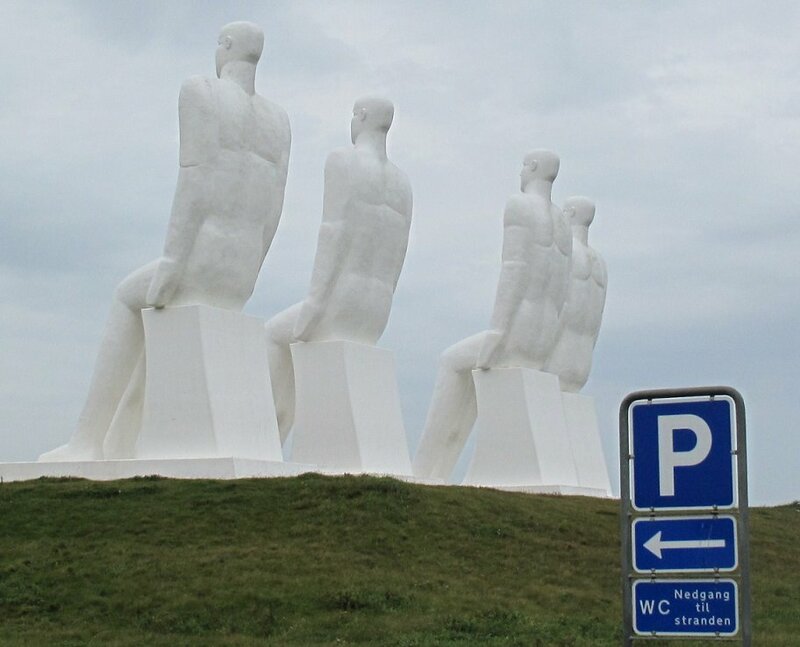 It consists of 23 cast iron figures placed to give the appearance of an imaginary column from Stavanger Art Museum to the city's harbour. 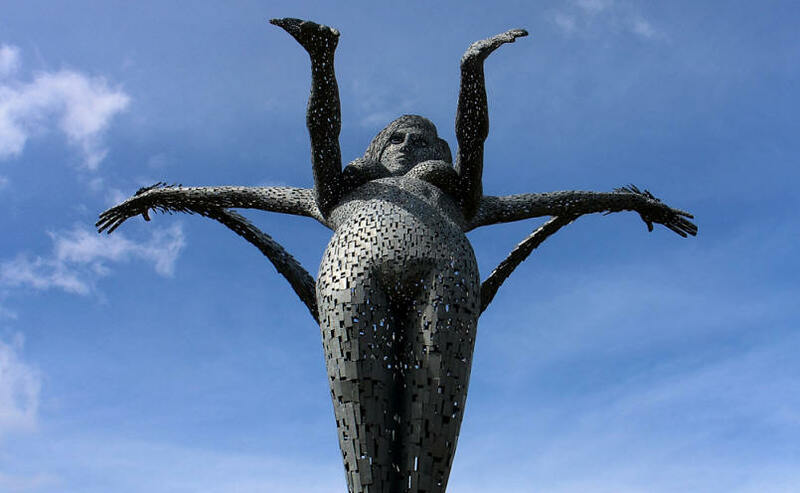 The figures in sandblasted iron are based on a casting of the sculptor's own body, and their placement reflects a broad perspective of people's life in this city. 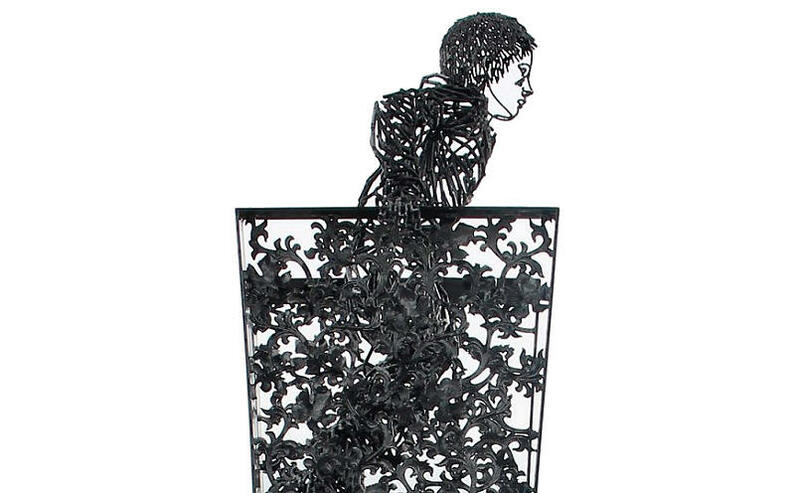 From the teeming life of the harbour, the din of traffic and bustling activities in the commercial quarter, to the courts and legal offices, the quiet calm of the churchyard and private lives behind closed doors. 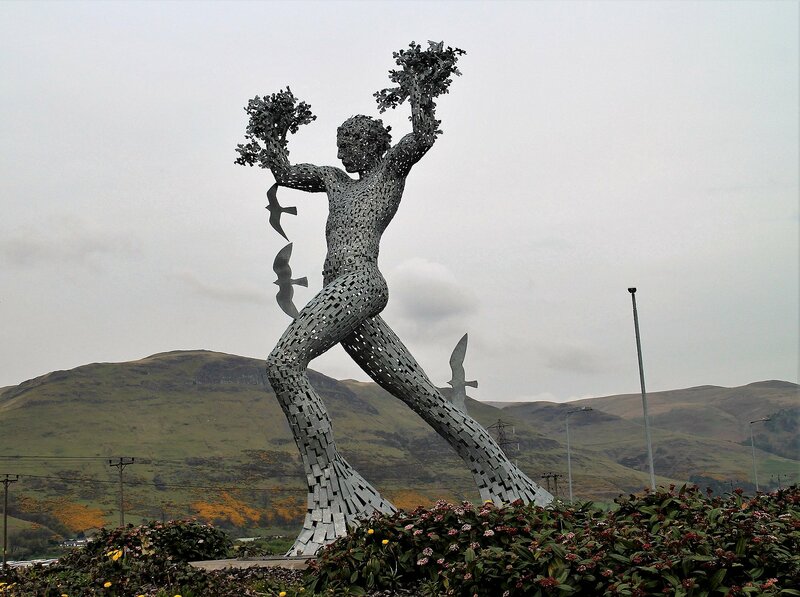 The iron figure standing in the fish market forms the cardinal point for all the other sculptures. 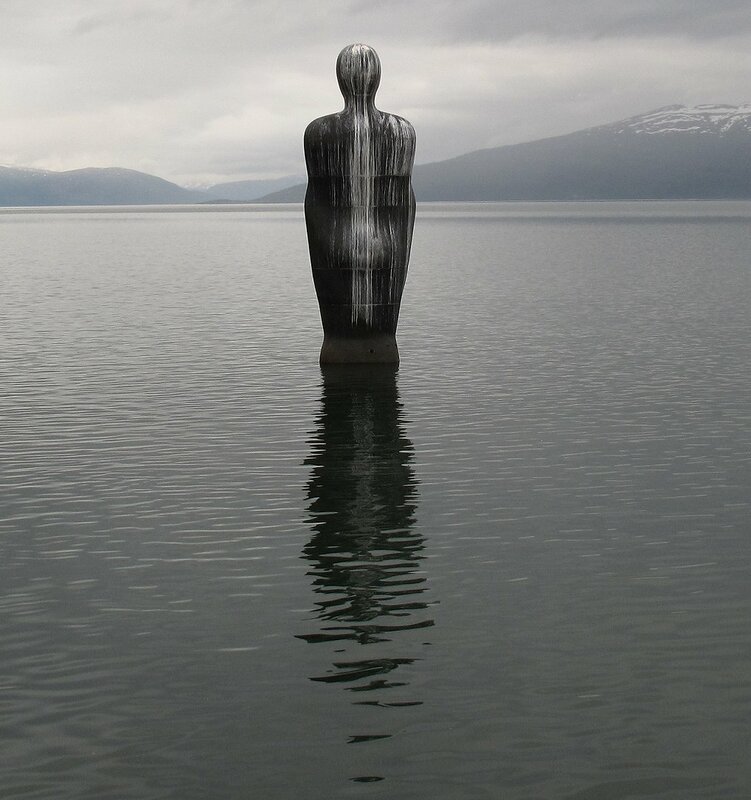 It gazes along Skagenkaien, 10 degrees towards the west, out to sea. 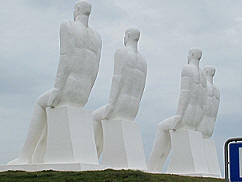 The height of each sculpture is the same height as the sculptor - 1.95 m. The very first sculpture was placed in its own room in Stavanger Art Museum. 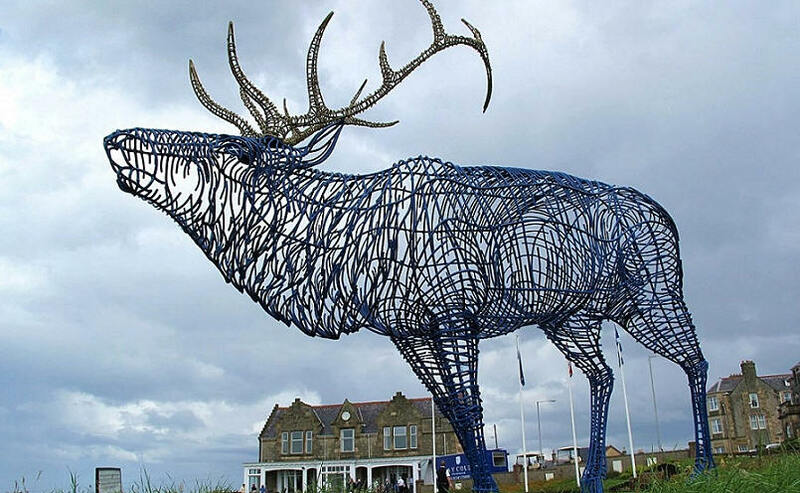 It stands 41.41 metres above sea level. 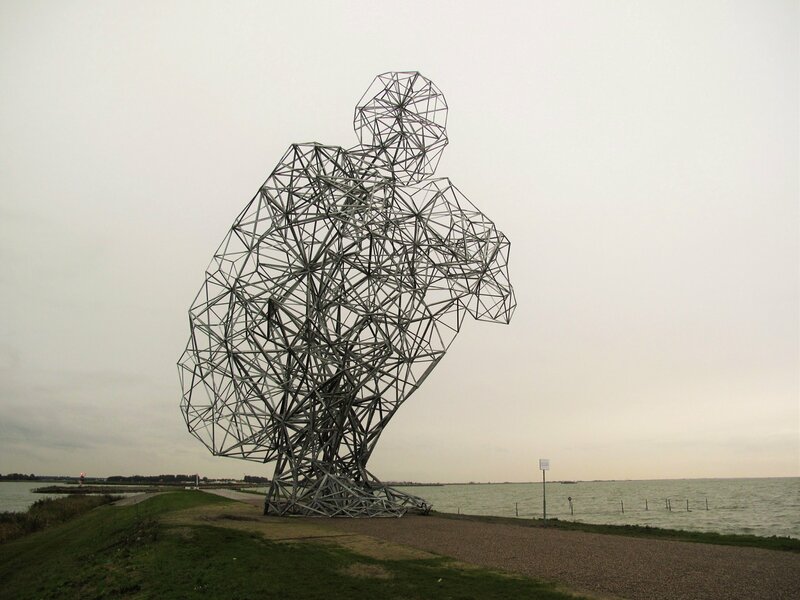 The next sculpture to be seen on the journey to the sea stands in Mosvannparken at 39.46 metres altitude (41.41 - 1.95). 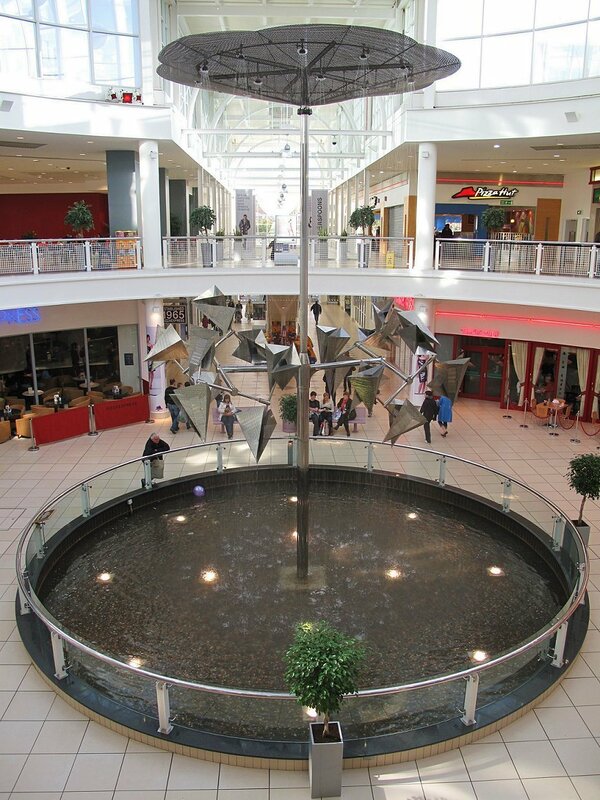 The column of figures continues in this fashion down towards the heart of the city, through the city and towards the sea. 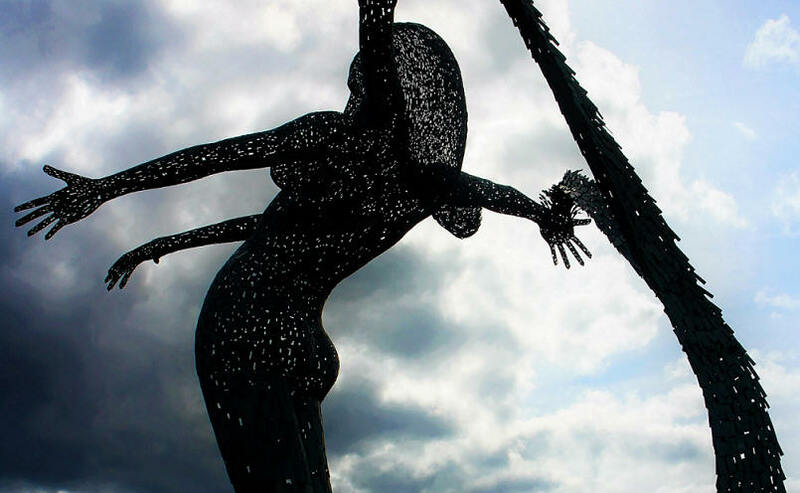 The final and 23rd sculpture stands with 149 of its 195 cm underwater, on a rock beyond Natvigs Minde in Stavanger's port basin. 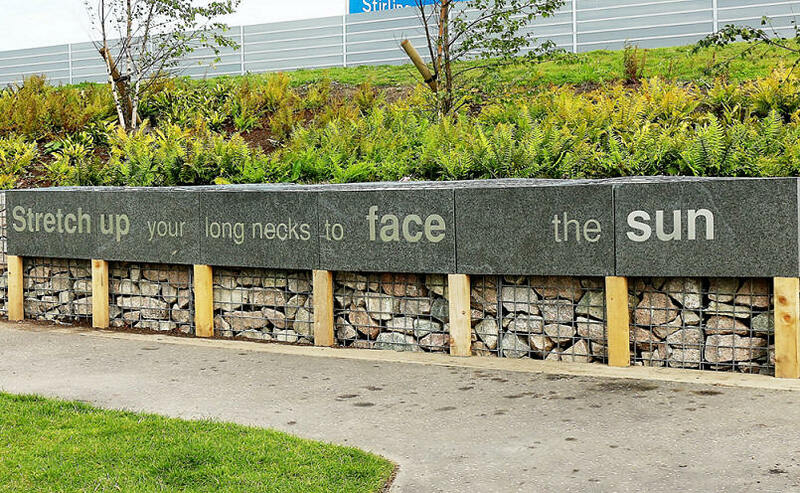 Sverd i fjell is a commemorative monument unveiled by King Olav in 1983, sited on the shore of Hafrsfjord in Madla, a borough of the city of Stavanger. 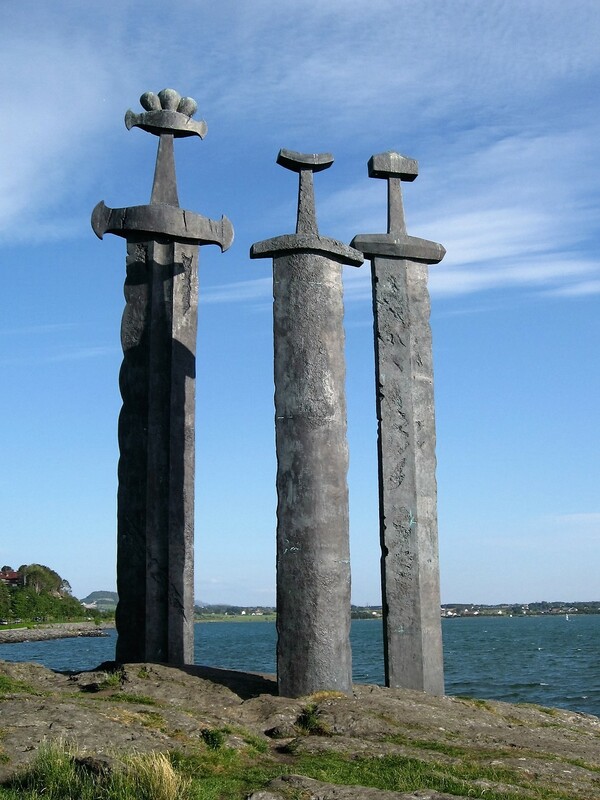 The three approximately 10 meter tall bonze swords represent, peace, unity and freedom and stand on the site of the battle of Hafrsfjord in the year 872 AD, when Harald Hårfagre (Fairheaded Harald) united the whole of Norway into one kingdom. 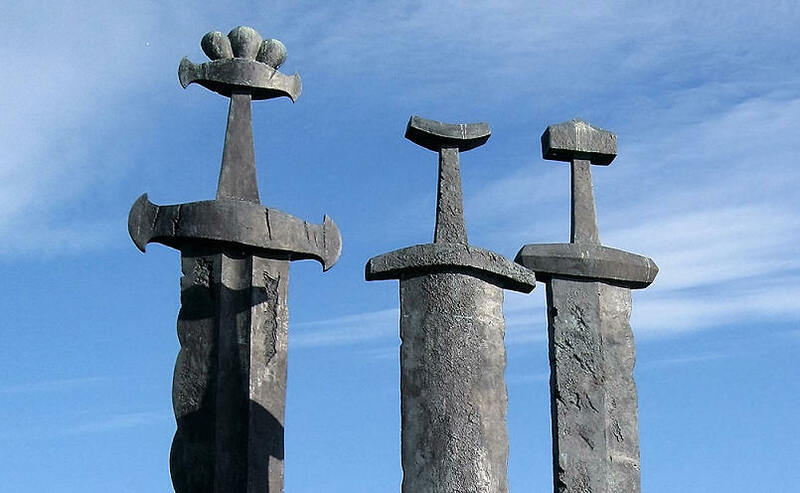 The hilts are modeled on Viking swords found in Norway, the largest is said to be modeled on King Harald's sword. 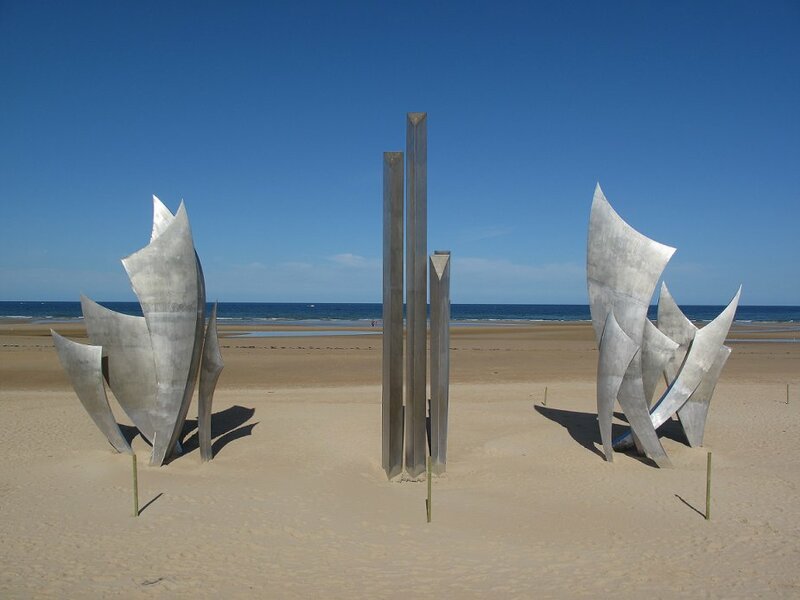 Omaha Beach St. Laurent-sur-Mer Normandy, France 2004, to commemorate the D-Day 60th-Anniversary 30ft stainless stee. 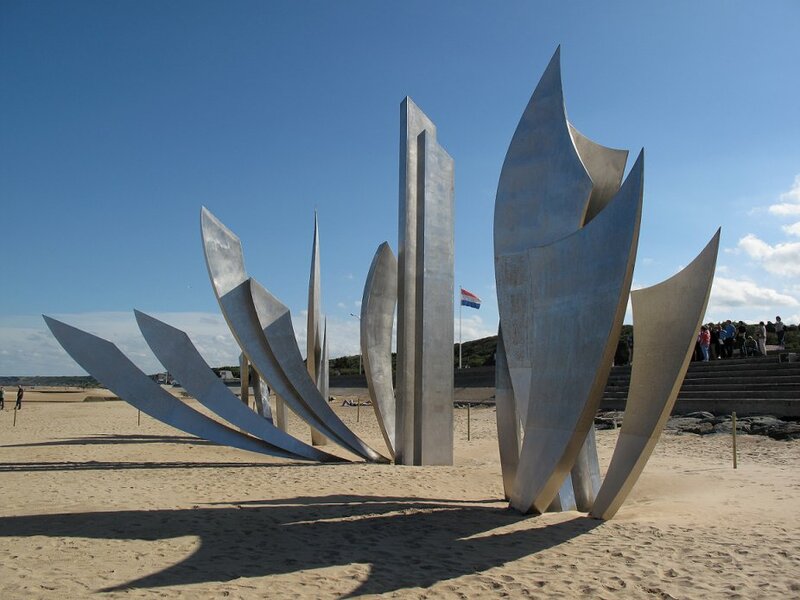 "The memorial consists of three elements: The Wings of Hope, so that the spirit which carried these men on June 6, 1944 continues to inspire us, reminding us that together it is always possible to change the future. 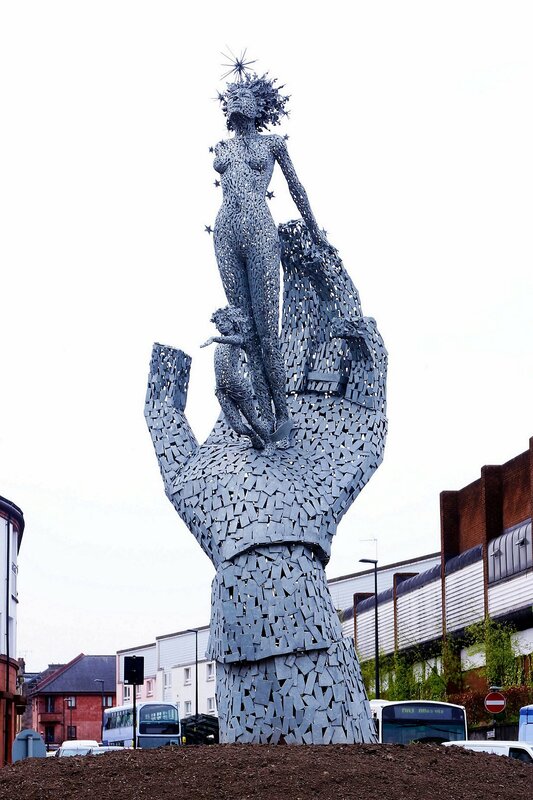 Rise Freedom! 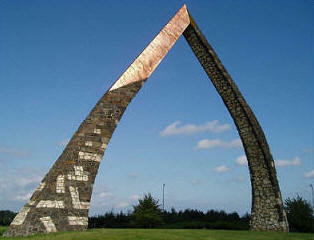 so that the example of those who rose against barbarity helps us remain standing strong against all forms of inhumanity. 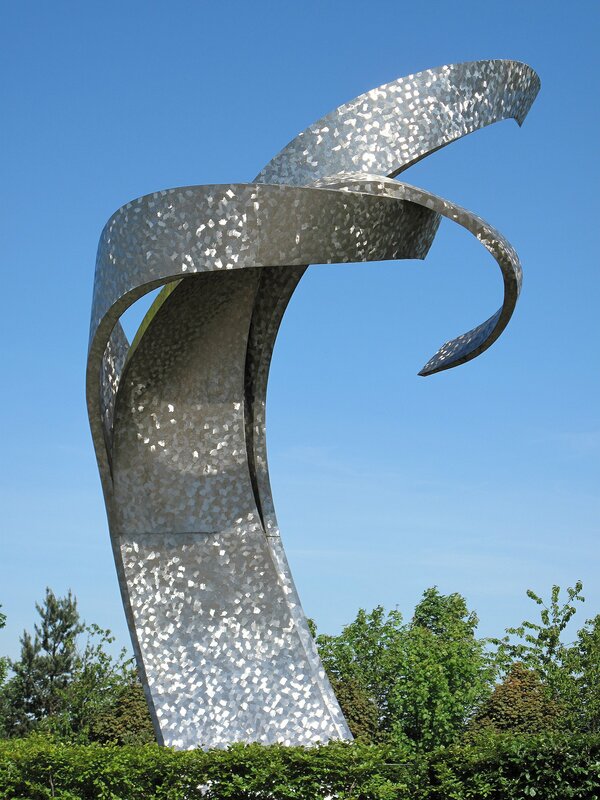 The Wings of Fraternity, so that this surge of brotherhood always reminds us of our responsibility towards others, as well as ourselves. 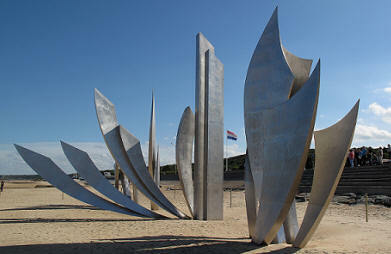 On June 6, 1944 these men were more than soldiers, they were our brothers." 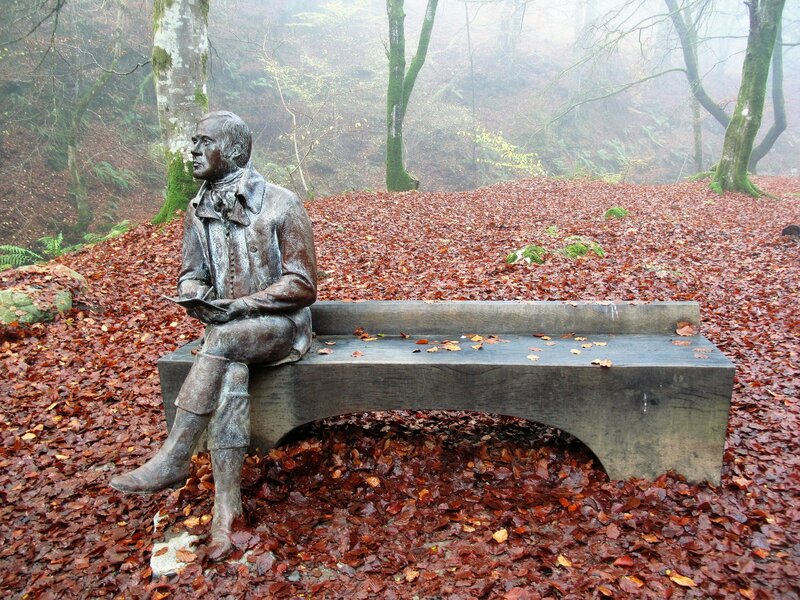 Sited at The Birks of Aberfeldy by the Urlar Burn, Perthshire, this Burns statue was commissioned by the Perth and Kinross Countryside Trust as part of the improvements to the Birks under the Perthshire Big Tree Country Heritage and Access project. 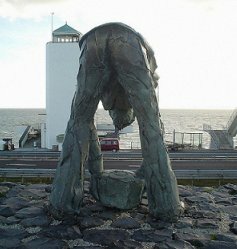 To commemorate the hard labour of the basalt workers, who played such an important part in the building of the Afsluitdijk Dam, Holland (1982). 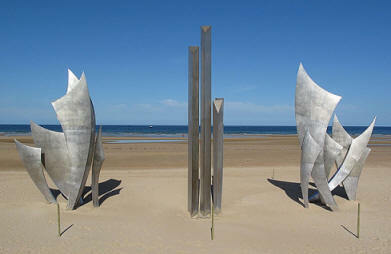 Located by Sædding Beach looking out towards Skallingen and the entrance to Esbjerg harbour in Denmark. 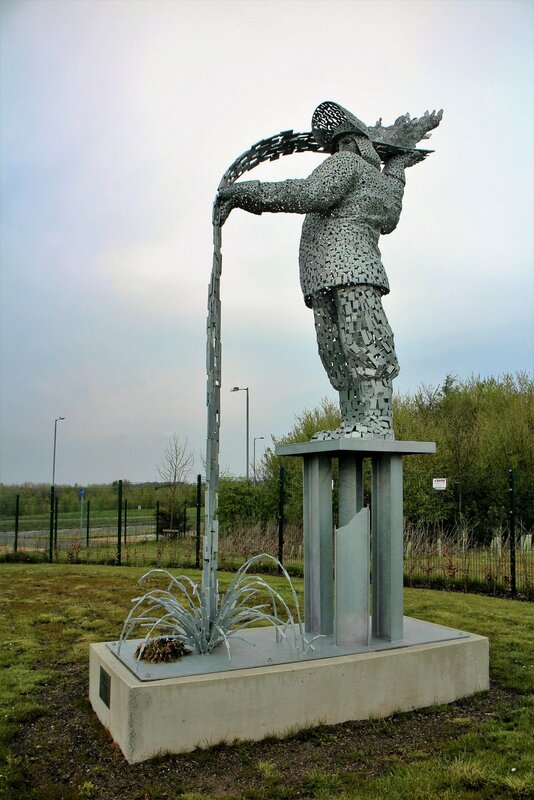 In 1994 Esbjerg celebrated it's 100th anniversary as an independent municipality and marked the occasion by commissioning this statue, which was officially unveiled on 28 October 1995. 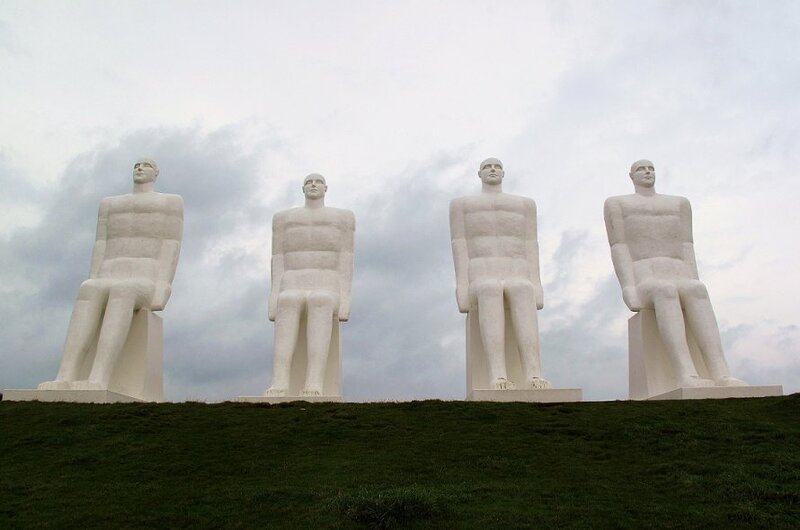 Four 9 meter high giant chalky white male figures.